Forest Leonard holds the "Dolls for Darfur" pins his class from Temple Emanu-El Sunday School have made to raise awareness of the violence in Darfur, Sudan. 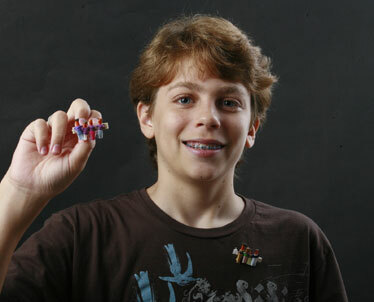 The project was Forest's idea for a community service project for his bar mitzvah. Some teenagers at Temple Emanu-El have been playing with dolls for the past few months. What that shows is that they aren't just kids anymore, but are ready to step up as adults. The eighth-graders from the School of Jewish Studies joined the "Dolls for Darfur" project started by a Texas synagogue to raise awareness about the victims of a genocidal campaign under way in the western region of Sudan. A United Nations official said last month that an estimated 300,000 people have died in the five-year conflict. About 2 million people are refugees, having fled violence against ethnic Africans by Arab militia gangs. The Oahu youngsters joined the program last year because Forest Leonard, 13, of Kailua decided to go global in his preparation for his bar mitzvah. They have made more than 100 "Dolls for Darfur" pins to be worn on shirts and lapels. With each pin comes an information card to prepare the wearer to answer questions about the colorful little lineup of people figures. They will be on sale for $5 each tomorrow at the Israel Independence Day celebration at Skygate Park. Leonard, the son of Ray and Nalani Leonard, celebrated his bar mitzvah last August. The celebration for a Jewish teenager -- called bat mitzvah for girls -- is a rite of passage from child to adulthood. It is mostly about accepting responsibility for your own spiritual and moral conduct. Nowadays there is typically a wider community service aspect, too. "They are taking on the mitzvah of partnering with God to repair the world," said Rabbi Peter Schaktman. The youngsters are expected to "demonstrate that commitment to involve themselves in some sort of world repair -- to enhance justice, decrease poverty, to act to fulfill that commitment." There are plenty of local causes and institutions where youngsters usually dedicate their energy. When Forest heard about the Darfur project and checked the Web page, "I really liked it because I am an artist, so I could do art and do charity together." The Temple Emanu-El class ordered pin-making kits and has been making them at the weekly Sunday School class. Joining the project were Carter Horwitz, Emily Lanter, Aviva Kosansky and Lauren Feldberg, along with teacher Helene Mann and her aide Kinto Diriwachter. 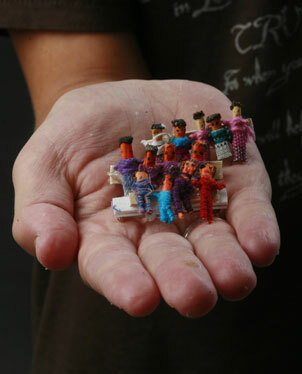 The tiny people figures are made in Guatemala of stiff paper and brilliant yarns. They are known as "worry dolls." Before going to sleep, children share their worries with their dolls, tuck them under the pillow and sleep worry free, according to a legend told at dollsfordarfur.org. Forest said it will be nice if the pins make money for the national project, but "the purpose is to raise awareness. Two million people are living in camps. They need medical help, food, water." "Those being killed are one bunch of Muslims, and the other Muslims don't like them," he said. "The janjaweed militia is killing rebels who wanted a religious state." A close-up of the pins. The idea of breaking down a huge number to see the individual people, one by one, or four by four on a Dolls for Darfur pin has roots in a documentary film, "Paper Clips," made by students in Whitwell Middle School in rural Tennessee. To help understand the magnitude of the Holocaust, the genocide of Jews by Nazis in World War II, the students decided to collect 6 million paper clips. "They got a railway car and filled it up with paper clips," said Forest. "Some Jewish kids came and thanked the students for doing it." The film was shown to the Sunday School class when it studied the Holocaust, he said. "Dolls for Darfur is especially poignant because of the experience the Jewish people have had through our history," said the rabbi. "We are well aware of what happens when the world turns its face away from something it doesn't want to see. "That's happening in Darfur, in full view of the world, with relatively few people paying attention to it," said Schaktman. Nalani Leonard said that as in most Jewish families, there are ancestral stories of oppression that make the Darfur violence resonate. Her paternal grandfather told of being among a group of Jewish men who were lined up and shot in Russia in the early 1900s. He fell, hidden by other bodies, and escaped. "My father was 6, and he and the other children were hidden when the Russians came for them," she said. "My grandmother was beaten. She baked her jewelry into loaves of bread" and carried it away as they escaped to Romania. They eventually immigrated to Brooklyn, N.Y.
Forest and his classmates talked about their family stories in class this year. When he sent thank-you notes for the bar mitzvah gifts from families and friends -- oh, yes, there is a reward for standing in front of the congregation to read and expound on a Torah passage -- Forest added a Darfur pin for each. Rewarding as they might be, there is a lot more to his art than doll pins. Forest was enrolled for six years in Daunna's art study in Kailua and has taken cartoon drawing and sculpture classes at the Honolulu Academy of Arts. The home is full of his duct tape and aluminum wire models of medieval armor and dragons, architectural models, maps of medieval cities. And, said his mother, "For Mother's Day he makes me a pretty painting." Mary Adamski covers religion for the Star-Bulletin. Reach her at madamski@starbulletin.com.